I have always loved to skate and play hockey ever since I was tossed onto a sheet of lake ice, wearing a pair of double-runners,by my dad way back when I was about 5 years old. I was hooked! Over the years weekends in winter were spent skating wherever we could find ice. We would play hockey from early morning to when you could barely see the puck at dusk. My dad would come home from work during the week, and say he had found some ice. I would grab my skates and stick, and off we would go. My dad would point the headlights of the car towards where we were skating so as to illuminate our way. My wife and I moved from Indiana to Wisconsin, where I found an elementary teaching position, in a small town called Whitewater. I would look for ice anywhere I could find it, but mostly skated and played hockey on one of the local lakes. There, guys like me, who enjoyed playing hockey would gather for a couple of weekend games. But that wasn't good enough. The ice got worse as the winters progressed and that wasn't good enough. So my wife and I purchased 3 acres of land and started plans to build a home, design landscaping, and put an outdoor rink right in the middle of that acreage. I purchased the perimeter boards from a city near by that had an outdoor rink, but was tearing it down, because, they said, there was lack of interest. So be it. I got the boards. 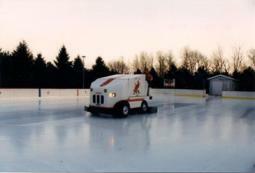 I built a 65' by 120' rink and with a garden hose poured my very own backyard rink back in 1990. Weekends were filled with a core group of guys that would come to play pick-up games. Everyone left with smiles on their faces, and I was wearing the biggest. The rink became known as "The Boisvert Arena", and the red and white jerseys worn to separate the rival teams had a "Glacial Crest Cardinals" logo on the front. We live on Glacial Crest Drive and we attract many cardinals to our feeders, so thus the name. A scoreboard was donated to the rink after the town's junior high school was demolished to make room for a new Middle School. A hydrant was put in to get more volume of water onto the rink, so improvements were being made to help improve the game and the making of ice. A liner was purchased and put down after spending many winters pouring into the ground only to lose the ice whenever the temperatures warmed to 32 degress or higher. That made a huge difference in time spent spraying and maintaining the ice. But I wanted the ice the best it could be for outdoor ice. And lo and behold, one summer morning while my wife and I were vacationing in northern Wisconsin, the answer to my ice maintenance problem appeared. I had gotten up early and wanted to see the new local ice arena that had just been built. I drove around the back for some reason, and there it was! A broken down, in bad need of repair ice resurfacer!! Abandoned and parked in the back of the arena, used as target practice by the looks of the puck marks on its surface. Conversations with the rink manager soon followed and a deal was struck. I now had my very own "Zamboni". A flatbed was rented from a guy in town and the resurfacer was hauled down to its new location. Days and weeks were spent in one-half of my garage, refurbishing the once sad looking ice resurfacer to a brand new one sporting "Glacial Crest Cardinal" logos on its front and sides. It was a sight to behold as the resurfacer emerged from its "nest" and layed down a sheet of glass that was as good as indoor refrigerated ice. At least that was my opinion. The guys would do the wave as the "zamboni" did its turn around the rink and passed by the players' benches. 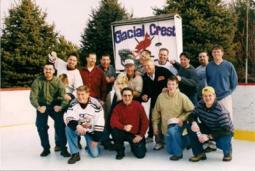 In 2003, "The Boisvert Arena" won the best backyard rink contest sponsored by "”icerink" and my favorite NHL player growing up as a kid came and spent a day at the now number one rink in America. Bobby Hull, the greatest left winger to ever play the game visited us, autographed articles brought by some of the guests, told wonderful hockey stories, and even went for a ride on that infamous ice resurfacer. 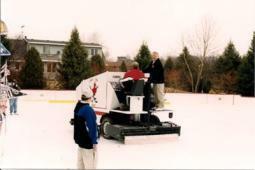 He also placed his signature on its side, making it the only autographed ice resurfacer in the world. (At least I think so) It was a day I'll never ever forget.